COLOGNE, Germany – The planned phasing out of the United Kingdom’s last Tornado aircraft has German officials scrambling to deal with the increasing costs of a shrinking fleet. Continuing aircraft reductions in the tri-national program, which also includes Italy, have led to “significant technical, logistical and financial risk” in maintaining the 1980s-era fighter-bombers, officials have told lawmakers in a confidential report seen by Defense News. While the prospect of Britain’s exit from the aircraft program has been known since November 2016, there is “no sufficient and comprehensive planning in place” for sustaining the remaining German planes, the report warns. German defense leaders decided in 2016 to extend the life of the Tornado through 2035, with an assessment planned this summer of implementation plans to that end. Berlin originally purchased 357 aircraft; 93 are still in the inventory today, 88 of which belong to the Luftwaffe, according to the defense ministry. A handful of German Tornados packed with reconnaissance equipment are currently deployed in support of Operation Inherent Resolve, flying missions over Iraq and Syria. The defense ministry’s March 2018 report leaves open the question of how, and if, the UK would retain some kind of role in the program. Last November, the document states, there was talk about introducing a new, fixed scheme for financial contributions, abandoning the practice of going by the number of airframes used in each nation. 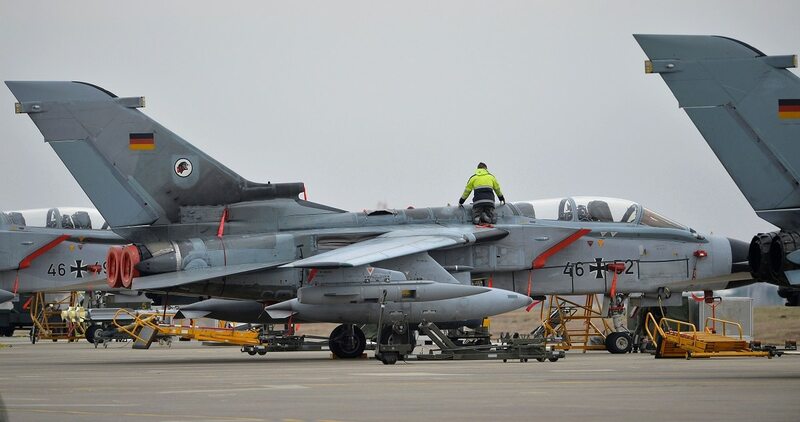 German defense officials wrote that they also are unsure what financial contributions can be expected of the Italians before Rome retires its Tornado contingent in 2027. The British plan to use the Eurofighter Typhoon and the F-35 to absorb missions flown by Tornados. In Germany, the Typhoon appears to be the defense ministry’s preference for a follow-on aircraft, though there are also voices advocating for the F-35. Officials have requested information on both planes from the manufacturers, plus data from the maker of the F-18 and the F-15. The new German government faces a major defense procurement decision with serious consequences not only for that country’s security but the future of NATO. “The UK has a large number of airframes left in storage in a variety of conditions and including various degrees of upgrades between GR.1 and the latest GR.4 ‘diamond standard’ as flown over Iraq and Syria,” said Justin Bronk, a research fellow at the Royal United Services Institute. Meanwhile, keeping the aging aircraft current is shaping up to be a challenging undertaking for the Bundeswehr. For example, digitization of the head-up-display likely will require the costly replacement of the aircraft’s main computer, officials wrote. That upgrade, which is at risk of coming late, is the prerequisite for the installation of a NATO-compliant friend-or-foe recognition system, mandatory by Jan. 1, 2019. The new capability, dubbed IFF Mode 5/S Level 1, is currently behind schedule, according to the defense ministry report, which means the Tornados could potentially only operate under special authorizations, if at all, in 2019 and beyond. The good news, per the German defense ministry: Other nations also appear to have trouble with the identification-system upgrade for their aircraft fleets, raising the prospect that NATO could delay the requirement.